Hope is the great weapon of all. 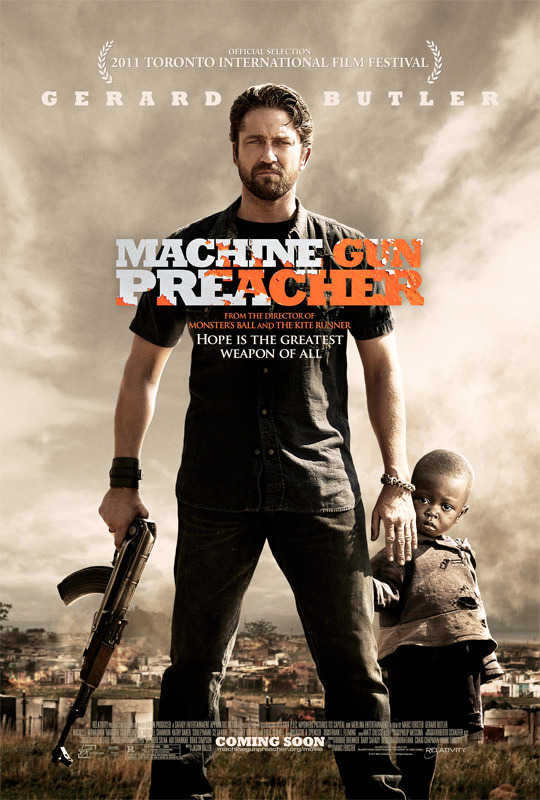 Relativity Media has finally unveiled an official poster on IMDb for Marc Forster's Machine Gun Preacher, starring Gerard Butler as the real-life Sam Childers, a former biker tough guy who finds religion and travels to Sudan where he becomes a local hero, building an orphanage and defending orphaned kids from being killed. We've been hearing about this film for a while, and just saw a first look at Butler a few weeks ago, so maybe we'll get a trailer soon, too. He's got quite a badass stance on this, defending his domain behind him. It looks pretty good, I'm interested. Check out the full poster below! That is one of the most unintentionally funny placements of an African child in film poster history. The child does have an interestingly perplexed look on his face. That aside, I am really looking forward to this film. I love Gerard Butler but the earlier posters are right, the welfare baby is something Of 80s relic. Where is Bob Geldoff? Yeah, I know the movie's about him protecting people/kids, but did they have to be so blatant? Maybe have the kid peak around his leg and not look like that commercial where the bugs are on their faces like - "Why?..." Gerard Butler was welcomed back into his manhood with his performance in Law Abiding Citizen. As far as I'm concerned Alex, he's just continuing his streak. "What you talkin' bout Gerard?" the poster is awesome!! my son has a part in this awesome film!! gerald butler has a natural talent, i look forward to seeing more from him!!! !